The Sportage’s new EcoDynamic+ 48V diesel mild-hybrid powertrain is the first to be launched as part of the brand’s global powertrain electrification strategy. Kia says it is the first manufacturer to offer hybrid, plug-in hybrid, battery-electric and 48-volt mild-hybrid technology across its full model line-up. Kia will launch 16 advanced powertrain vehicles by 2025, including five new hybrids, five plug-in hybrids, five battery-electric vehicles and, in 2020, a new fuel-cell electric vehicle. 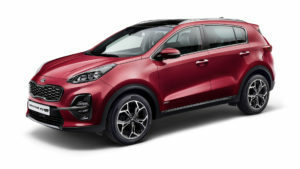 The Sportage’s existing 1.7-litre CRDi (Common-Rail Direct injection) diesel engine has been replaced with Kia’s new 1.6-litre ‘U3’ CRDi engine, which the company describes as the cleanest diesel engine it has ever made. The new 1.6-litre diesel engine produces 113 or 134 bhp, with higher-powered models available with all-wheel drive and seven-speed double-clutch transmission. Improvements to the Sportage’s exterior design include new front and rear bumpers, as well as redesigned front and rear lamps and new 16-, 17- and 19-inch alloy wheel designs. Options include chrome sill trim and metallic skid plates, and five new paint colours.